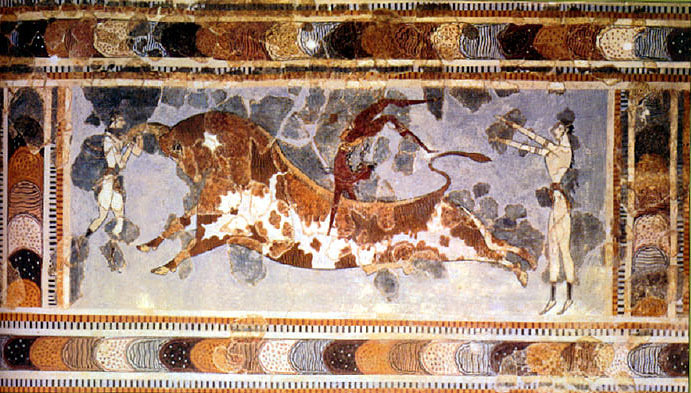 The Minoans engaged in boxing, wrestling, and a remarkable athletic activity, bull leaping. 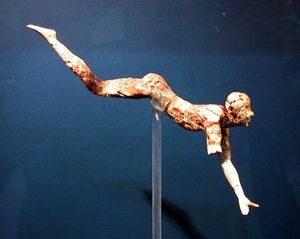 Bull leaping was a strenous physical activity, more like gymnastics than bull fighting and both women and men were athletes. The bull was not harmed as part of the activity, though it is possible that it was sacrificed afterwards as part of a religious ritual. In this wall fresco from the palace at Knossos, we see women on either end of the bull with a male leaper vaulting the bull. J.C.Younger has studied a sample of fifty-four bull-leaping scenes and classified them on the basis of three different jumping techniques. In one type, the leaper approaches the bull from the front, grabs the horns and somersaults backwards. 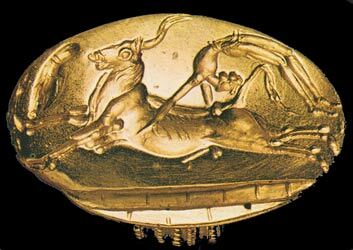 In the second variety the leaper approaches the bull from the front, dives over the horns without touching them and pushes himself with his hands from the bull's back into a backward somersault. 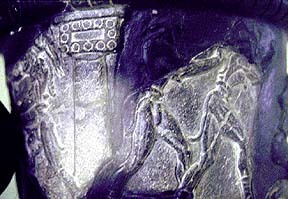 The third type shows the leaper in mid-air over the bull's back, facing the same way as the bull. Physical training of boys and girls began at a young age. Boxers and wrestlers wore sandals and necklaces. 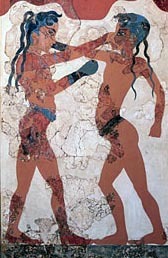 Wrestlers wore a helmet with cheekpieces, but boxers left their head uncovered, with an elaborate hairstyle. The winner is portrayed with raised left handand the loser is shown on his knees or avoiding the blows.